ILLUMI FEST RUN is back with a bigger splash than ever! This year, the home-grown run is part of the popular I Light Marina Bay and is set to turn the bay area into a vibrant display of glowing neon colours on 31 March 2018. 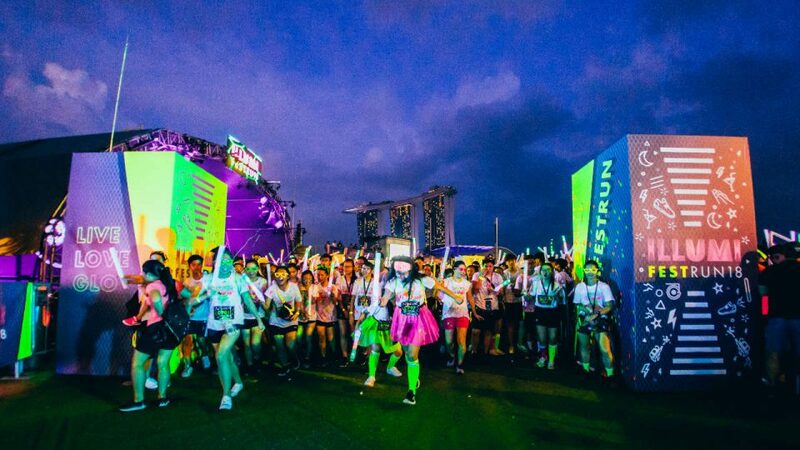 This year’s run will see participants getting doused in ILLUMI Glow Water as they run and dance through a new thrilling route in the heart of Singapore – Marina Bay. Showcasing fresh music beats and many photo opportunities at each of the ultraviolet zones along the way, the course guarantees the ultimate splashing fun for an amazing Neon Playground atmosphere. The ILLUMI FEST RUN continues into the night with extreme party vibes. Dance the night away at the ILLUMI Fest Village Party Box, which will feature the GLOW Series of games such as Glow Beer Pong, Glow Bowling, and Glow Twister. Skid through the new giant ILLUMI Slide, or have a go at the ILLUMI Paint War! Gather your friends, ILLUMInate your night and get ready for a Glow-fantastic time under the stars.